This simple crochet mini basket is the perfect nightstand accessory to store your ponytail holders and bobby pins! Hello again! 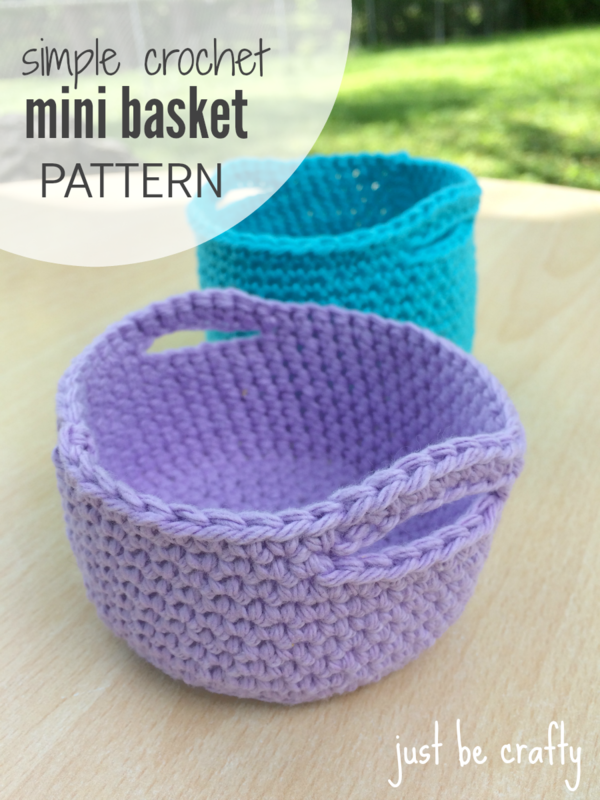 Today I am sharing with you a pattern to create mini crochet baskets which are totally functional and super cute! I made a couple of them for drawer organizers because lord knows my drawers organizing. 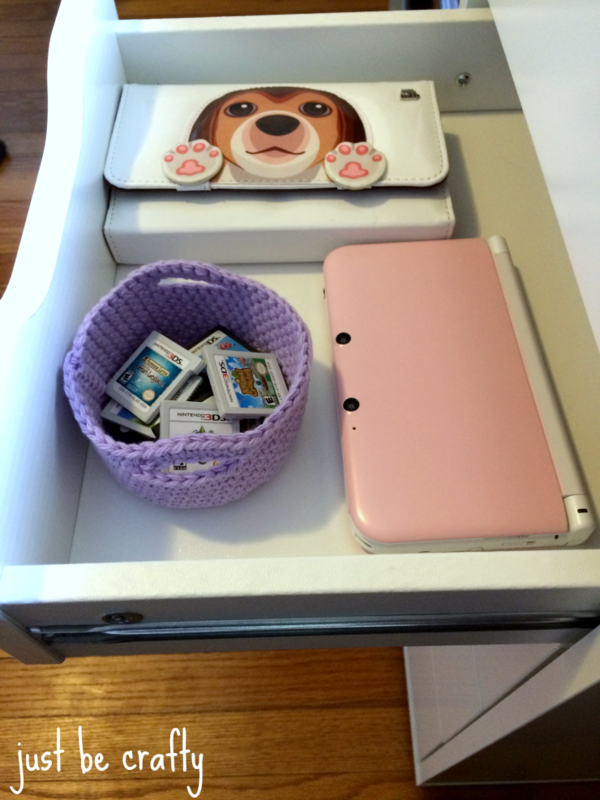 Below you can see one that I already put to work in my “nerd” drawer to hold my DS games, but really they could hold anything. I might make up a few in some neutral colors to hold soap in the bathroom or hold jewelry on my nightstand. Today was a little overcast so I was having a difficult time taking photos. I usually like to have a couple more shots of my projects so you can really get a feel for what the finished product looks like before you make it, but the sun just wasn’t cooperating. It held out long enough to get in a couple of shots, so I am sure you get the picture. Luckily this is a quick project so you will soon see for yourself how awesome and useful these little baskets really are! A printable download copy of this pattern is available for purchase here. Inc – In this pattern it means to increase, or make two single crochets into the same stitch. Start each new round with a chain-1, but this chain-1 does not count as a stitch. At the end of each round, join with the 1st single crochet of the round and NOT the chain-1. Cut yarn, and use yarn needle to weave in ends. Awe thank you! I’m glad you enjoyed it! Fun! I’m going try them. It looks like this is a cotton yarn? Thank you! Yes, it’s Lily Sugar n’cream. This is great! Sugar&cream is such great yarn with beautiful colors, and I always love 1 skein projects! Can you get 2 out of one skein? Yes, depending on how tall you make your basket 🙂 but if you follow the pattern you should be able to get two out of one skein. My chain 1 becomes part of my first single crochet….? isn’t the chain one part of the 1st crochet? I know it sounds too simple to mess up but I was just confused. Is there a clear picture of this in the pattern that is for sale? Thanks in advance! Yes, it does kind of blend in with the first crochet. It’s not a big deal if you start each round in the chain 1, just if you start in the first single crochet instead, it helps create a more flawless look at the start of the round. It is kind of difficult to explain without a photo tutorial. I may need to do a photo tutorial on this…thanks for the idea! I unfortunately do not have a clear picture of this in the paid pattern. On Facebook this morning it shows baskets of larger sizes as well as the small ones. I couldn’t find the free pattern there do I went to just crafty but I still don’t find the pattern for the larger baskets. If there is a link to the pattern it is not anywhere I can find it. I have also tried this but find I end up with an extra stitch, I’ve made 3 baskets now, each differently. I was unsure whether to slip stitch in to the first stitch (skipping the chain) or just carrying on with slip stitch as I would gain one. Maybe I’m slip stitching wrong! Doing a slip stitch created a curved seam, which looked kinda cool, not doing one made it a bit gappy where I jumped from the last stitch over the chain and to the first stitch! Hmmmm a mystery! Also, when you crochet in the round and join after each round it will create a crooked seam. There are tricks to avoid this, but I wanted to keep this pattern simple and beginner friendly! Dear Brittany, your little baskets are adorable! <3 Thanks for sharing, I cannot wait to try these. Can you tell me how much of that yarn I need to make one basket? I have a leftover of a beautiful yarn and I am not sure whether it is enough or not. Hi Joan, I unfortunately do not know the exact yardage for this project, but it is not a lot at all. The nice thing about this project is you can adjust the height of the basket with how much yarn you have. Thank you for stopping by! Such delightful mini baskets! They enticed me to make one. Actually, I have made five of the small size; then increased the diameter by one additional round, and made five more. They nested together so nicely that I gave each of my married daughters a set! They loved them. Thank you for such a lovely pattern…a joy to make and to give! I am using your pattern but I am doing a bigger one to have beside the sofa with afgans. I have a question, my basquet keep on falling down and I do not find a solution to avoid it to keep folding. How do you manage to maintain the basquet up? Hmmm…I have only made the mini baskets so far, but I think in order to make a large baskets that would fit afghans you may need to use a thicker yarn and larger crochet hook in order for the basket walls to stay rigid. I read on another basket tutorial, that if you spray the basket with starch, it will become stiff and will stand better. Crochet with two strands held together. I don’t have any Sugar n’ Cream yarn, and am not familiar with that yarn. What other yarn can you use? Would worsted yarn work? I love your basket. In response to Veronica’s problem about the basket falling over -if you use a double strand of the Sugar ‘n Cream, it produces a sturdier basket than one worked with a single strand. Hope this helps. I really appreciate the extra instructions and explanation in the pattern. I know how to do all the stitches, but crochet patterns are really hard for me to follow. I have to sit with one of those translator graphics and write out patterns just to understand them. I can’t wait to try this one! Hi Brittany…I just love this pattern….I am making 30 mini basket for my son’s classmate for Halloween…and this is so simple to fallow…I made it with with yarn and just going to add orange and black ribbon for the theme…I wish I can send you a picture….Thanks always…can’t wait for you to come up with other patterns! Hi Ceil, please check out link below for a youtube tutorial on how to do the magic ring. When you complete the basket to do you typically turn it inside out? I made one of the baskets and really like it! Thanks for the pattern! Yes, sort of but only the inner loop instead of the back loop :). I made the smaller basket and love it. Thank you. I did have one problem tho. Your basket stays up with straight edges. Mine has curved inward. How can I avoid that. Oh these are so cute!! I think a little larger and they would be adorable Easter baskets! Love your site and would like to get your newsletters. Great ideas!!! Just started this project and its already turning out great! It’s great to use up some of the leftover skeins I had from an afghan I finished. I had been looking for a small basket that didn’t need super chunky yarn for a little while now and this is perfect! Thank you! I wanted to tell you that I featured this pattern on my blog. I did use some of your pictures to feature your baskets and did give you all of the credit for your wonderful creations. If any of this is not okay please email me and I will remove the post. Thanks for such a wonderful idea! Where can I find the yarn for the crochet Mimi basket. Hi Karen! You should be able to find Lily Sugar’n Cream Yarn at any Joanne Fabrics, Michaels, or AC Moore. Any worsted weight cotton yarn from any craft store will do! I just can’t wait to make the baskwts. I had carpal tunnel surgery last week and I have to wait for my hand to heal then it’s off to crocheting baskets. Thank you for giving me a pattern to be excited about. a friend wants me to make this to hold a soup bowl – would this pattern work for that? I’m currently working on this pattern right now–with the Sugar ‘N Cream yarn–and I’m running into a problem. The bottom is curving up, so it’s not lying as flat as it is in the pictures. Hi Deborah! Have you finished the basket yet? Once you finish the project and shape it to form a bit with your hands, the basket should lay flat. If not, you may need to wet block it by dampening the basket and shaping the bottom to sit flat and let it air dry. I love this basket!! I want to make one today, I have the yarn but I cannot find any info one which size hook to use. Thanks!! Brittany, never mind!! I found the size!! Maybe I should wait…too early in the morning??? :). Thanks for the pattern!! Looking forward to my new basket!! Thanks again!! Hi! I just finished the small basket pattern yesterday and I absolutely LOVE it!!! They are so cute, an I’m using it to hold my current crocheting projects. Thank you so much for sharing, and I’m really looking forward to making more? Also happy Easter to everyone!! I don’t know if you have ever done this but when you make a basket have you ever had to use something to make it stiffer so that it won’t fall over or if it needs to be washed it will stay stiff? Hi Tisa! I have actually not tried that. 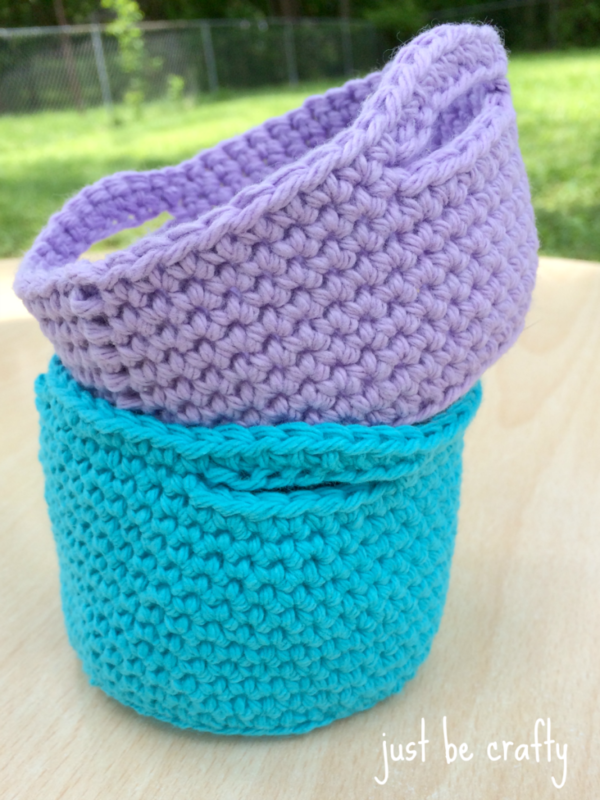 With the thickness of the cotton yarn and using the tiny 3.5 mm crochet hook, the basket stays sturdy and does not fall over. If you find that your basket is not holding it’s shape, you might want to try using a smaller hook and tightening your guage, or doubling up on your yarn. I would love to watch a video on how to make these adorable lil baskets!! I find it hard to follow the written instructions. As you can tell I’m a newbie at this and I’ve already looked on YouTube but not one looks as good as yours!! Please let me know if you are willing to do a video. ? omg, i have animal crossing too! Completed. Thank you, wish I could upload the photo, I have used waste material from work, and it looks good! Hi I’m a newbie and couldn’t understand what you mean in rounds 8 and 9 ” single crochet in inner loops ” and both loops? I just loved the baskets and am looking forward to make them. Hi Kavita! in a crochet stitch, if you look at it from the top view, you will notice that at the top of each stitch there are two loops. The loops closest to the inside of your basket will be the inner loops, and the loops closest to the outer edge will be the outer loops. Let me know if that helps! Thanks so much for sharing the pattern. Just made a small basket and it’s lovely! I used Rico Creative Cotton (aran). For anyone who finds it fiddly to do the chain 1 and joining of the rounds – I forgot to do it, so continuous rounds work well too. These baskets would be enjoyed by little girls to put small treasures in. A great gift idea! Thanks again. Thank you! I am so glad you enjoyed the pattern! Hello! These are adorable. I’m working on my second one. They are going to be gifts for my daughters’ teachers. Question- do you turn the basket inside out when you’re done? If not, then the back of the stitches is exposed on the outside of the basket, and the seam of mine looks slightly unattractive! I know if you turn it inside out you don’t get that nice flat bottom, it gets rounded instead. Just curious if you flipped them inside out or not?! I’m replying to my own comment. Now I’m really confused! I can tell from your pictures that your baskets are the reverse of mine (inside out from what mine is). But how did you get it like that if you did inner loops and not outer loops in round 8? Is anyone else having this issue?! I could just flip mine inside out, but then the bottom is rounded and not flat, and they don’t sit right. Hi Melissa! In Round 8, when you crochet in the inner loops, this should create a little line (the line is composed of the outer loops that you did not crochet into). That line should be on the outside of your basket. As long as that line is on the outside of the basket as you crochet in the round, you should have the correct side facing out. For a rounded bottom – you may just have to shape it a bit with your fingers, and once you put things in your basket it should lay flat but if it’s still too rounded you might want block it by wetting it and shaping it to form and letting it air dry. I’m still so confused about how this pattern produces the baskets you have pictured. Am I just crazy?! I followed the pattern exactly but my baskets have the “wrong side” of the stitches and the lumpy side of the seam on the outside of the basket, whereas your pictured baskets have those on the inside. I’ve been flipping mine inside out to get the “right side” of the stitches on the outside of the basket. I sacrifice the nice flat bottom by doing this, but it’s not that bad. With the very thick wool on sale and the extra large crochet hooks, I think it will be possible to make a cat basket. I have the powder starch that needs dissolving prior to application. Their instructions are to soak the product and when semi-dry iron with warm iron BUT I don’t think they make allowances for baskets. Do I just leave to dry naturally or is the warm ironing part of starching process thus cannot be skipped??? ?